The first day of the eThekwini Youth Employability Indaba and KZN Career Expo kicked off on a high note as various inspirational speakers shared the stage to impart valuable information to the youth about various career prospects. The event is held at Durban Exhibition Centre from 24-26 May. The event is aimed at addressing youth unemployment challenges and will provide young people a platform to empower themselves with abundance opportunities available in the KwaZulu-Natal province. Indaba and career expo features a career expo component to help connect youth to employment opportunities, career information, scholarships, enterprise support programmes and bursary information. Opening the conference, attended about 7000 youth, MEC for Co-operative Governance and Traditional Affairs, Nomusa Dube-Ncube said Government wants to address the challenge of youth unemployment and to accelerate economic transformation. She said Government supports working together with all young people to build a winning KwaZulu-Natal that is globally competitive. “The unemployment rate, especially among youth and those who are graduates is increasing but we also suffer from skills shortages. I urge youth to enroll in technical, engineering and technological related courses,” said Dube-Ncube. “Government is committed through the National Development Plan to improve lives through education. To do this, we need to strengthen partnerships between private companies, educators, learners, parents and communities,” Dube-Ncube said. The Chairperson of the Governance and Human Resources Committee, Councillor Barbara Fortein said that it cannot be business as usual when young people remain the lowest represented group in strategic decision making bodies. “As an inclusive City we want to see the youth involved in the growth of our economy. EThekwini Youth Employability Indaba and KZN Career Expo will discuss youth empowerment issues and the role that local government can play to ensure greater participation of youth in building an inclusive economy,” said Councillor Fortein. The Chief Executive Officer of Durban International Convention Centre (ICC), Lindiwe Rakharebe, said ICC has sustained about 93 000 jobs within business tourism sector and supporting industries. 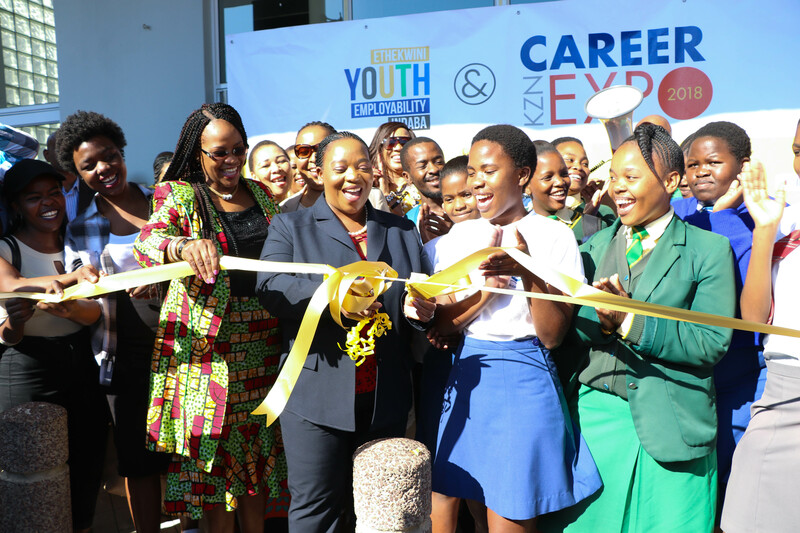 “The three-day Youth Employability Indaba and Career Expo will enable ICC to play an instrumental role in job creation and continue to be an instrument for growth and economic development in the Municipal area and KwaZulu-Natal,” said Rakharebe. “We need to identify skills development areas where the programme should concentrate so that we develop skills that suit the existing and future needs of the various industries. Various exhibitors are showcasing their offerings and services,” she said. Nkosibomvu Secondary School teacher Sonto Mthembu, said that her school is career driven and wanted to explore various careers choices for learners. “Most of our learners are interested in science, however, we do not have a laboratory. It is our first time attending the career expo and our learners were excited to see science experiments conducted,” said Mthembu.